Moenkopi is acting as fiscal sponsor for the feature-length documentary film From Ghost Town to Havana, produced and directed by Eugene Corr of Playtwo Pictures in Berkeley, California. 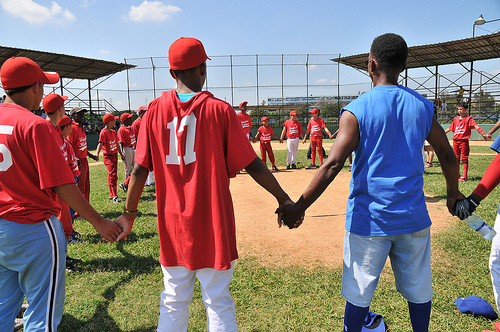 Since the summer of 2007, the project has followed the lives of Afro Cuban boys growing up in Centro Habana, Cuba playing baseball for Coach Nicolas Reyes, and African-American boys growing up in a neighborhood in West Oakland called “Ghost Town,” playing for Coach Roscoe Bryant. 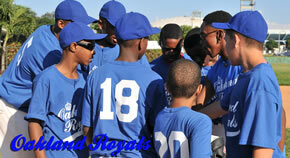 In the Spring of 2010 Coach Roscoe Bryant leads nine of his wary street-wise players, including 13 year old right fielder, Chris Fletcher, on a trip to Cuba to play baseball against Coach Nicolas' team. On the last night of a beautiful week of baseball and friendship, Coach Roscoe receives a call from home. Chris' stepfather has been murdered. Can Coach Roscoe persuade his players to embrace life in the midst of death? The film highlights the tough path Roscoe's players must follow to find a way out of a life of poverty and neglect and the key role mentors play. If you would like to donate to From Ghost Town to Havana, click below. Your contribution is tax-deductible. Moenkopi completed the feature-length documentary film --Knee Deep-- about a young Maine farm boy named Josh Osborne and his desperate attempts to hang onto the family farm while his family was falling apart. The film was aired on PBS as part of the award-winning INDEPENDENT LENS series and won critical acclaim and numerous awards. Looming over this deeply personal story is the public issue of development--and its impact on farm families and open space. Almost half the farms in new England are located in Maine and Vermont . More than one third are between 50 and 179 acres--the Osborne farm was 165 acres. But in one recent five-year period, New England lost 11 percent of its farms. Maine alone has lost 700 dairy farms --out of a total of 1100-- in the last twenty years. According to friends and family, Oliver Osborne was a successful Maine dairy farmer--with success defined as staying in business and hanging onto the farm. Oliver would milk in the dark to save money. When prices plummeted, he joined other dairy farmers in dumping milk. He expanded his herd from 50 cows to 100 to increase production and compete with the megafarms of Wisconsin and California. Yet despite his ability to eke out a living from the farm, the stresses on his family would ultimately undo all his hard work and set events on a course leading to the eventual sale of the farm. Driving down the Osborne Road today, one sees no evidence that three generations once worked the land here. Instead, “For Sale” signs for the West Grand View Estates line the road where cows used to graze. In a final irony, the deed restrictions for the development prohibit farm animals. The preservation of open space is vital to a state’s aesthetic and economic well-being. To that end, the film also looks at another farm family, the Chases. Pat and Robin Chase have lived on 70 acres in Whitefield for the last thirty years, where they raised five children. For the last eight years, the couple has run two dozen dairy cows on the Chase Family Farm. On weekends, Pat takes her baked goods down to the Bath Farmer’s Market to supplement their income. The Chases recently obtained a grant from the Maine Farms for the Future program to ensure that the farm will remain agricultural at least for the next five years. When Pat’s uncle died five years ago, they applied to the Sheepscot Valley Conservation Association and the Maine Department of Inland Fisheries and the Outdoor Heritage Fund for grants that would allow them to buy the valuable 65-acre property that runs for 1200 feet along the Sheepscot River. This is where the Chases now keep their young stock, winter their heifers, and obtain their hay. In exchange for the grants, the couple granted a conservation easement for a 250-foot buffer along the riverfront, one of the last remaining waterways in Maine to provide a habitat for the nearly extinct Atlantic salmon. The Chases call this parcel The Happy Farm, after a giant smiley face painted on the barn, and it will remain forever farmland, even if it is sold, meaning it will never succumb to development. “I’m certainly not gonna let it be developed-no way. I’ll give em to a church group or I’ll give em to somebody first…Because I hate the encroachment part of it. I’ve lived here all my life and you ride around the town here now and there’s just houses everywhere. …There was like 22 or 24 dairy farms here in town…But there’s just these three left here and all the other farms have been broke up and houses put on ‘em. And I just -in some ways this sprawl has to cease a little bit”. The Moenkopi Group is currently developing a project, tentatively titled A Sense of Justice, on the lack of access by ordinary citizens to the American civil justice system. The film will be an entertaining, groundbreaking and informative feature-length documentary. We are building a library of interviews of ordinary citizens who have had great difficulty obtaining justice through the courts, many of whom will be featured in the film and also as an internet resource. There has been great interest in the project, including from a theatrical distributor. Shooting and fundraising are ongoing.